The economy is grappling with low levels of intentions to invest as the gross fixed capital formation as a per cent of GDP, a proxy for investments, has fallen to 28.9 per cent in Q2FY18 from 31 per cent in Q1FY1. This was primarily on account of fall in new investment projects. 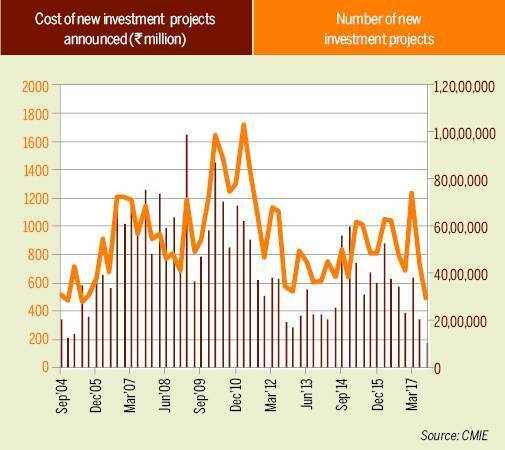 To be precise, cost of new investment projects has been declining consistently since the March quarter of 2017. This is not all, projects worth Rs 10,32,845 million were proposed during the September quarter which was the lowest level of new investments projects announced in a quarter, over a decade. The fall in the flow of new investment proposals was largely concentrated in the private sector whose proposals fell to their lowest level over the same period. New investments have remained anaemic over the last few quarters after a brief resurrection during 2014-15. Here's hoping for a recovery next year.